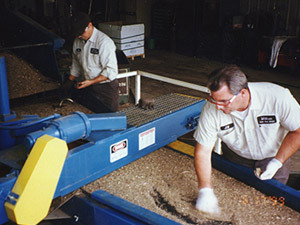 Hustler’s "Money Maker" Sorter Separator increases the profitability of your sorting operation. Money Makers can save you 50 to 100 hours per week of sorting, separating, and cleaning of non-ferrous materials. Sorting height is 47" from base to pan thus allowing direct loading into steel drums, hoppers, or Gaylord boxes. The standard Money Maker is completely portable and no foundation is necessary. It offers a foot operated start and stop pedal in addition to TEFC motors and controls. 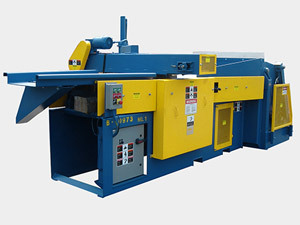 It is also equipped with a self-cleaning permanent cross-belt magnet, which is adjustable by hydraulics and an automatic hydraulic dumper for drums or Gaylord boxes. Another great feature is an automatic dirt removal system with discharge chute. To meet your individual production needs Money Makers can be increased in length and widths. They can also be supplied without the cross belt magnet.